Back in college when I interned at Dallas Fashion Week, I was able to attend some amazing shows – one of them being Rodarte. Being somewhat of a high-end neophyte in 2008, I had never heard of Rodarte before and was enamored by their beautiful gowns in loud colors, delicate drapery and a variety of shapes. 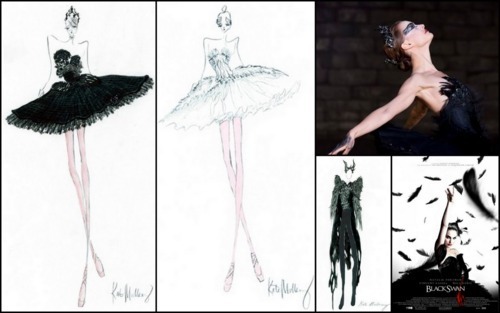 I only decided to write about the designer (or designing sister duo) now, because of my fascination with the costumes they designed for the recently released Black Swan. You really begin to see the true talent of a designer when they are forced to step out of the box and design for something unusual or atypical to their normal collections.The images below are sketches from Rodarte’s designs for the movie, along with photos of the ballerina costumes and a beautiful lime gown from one of their other collections.